So, as usual, your ice fishing season cannot begin without an insulated bib or ice fishing suit, a toasty-warm winter parka, and a pair of reliable windproof gloves. However, none of these winter clothes will provide you the necessary cold protection without snow shoes. While your winter boots may have stayed with you for 15-20 years, they need a replacement occasionally – and no fishermen can allow themselves to be unscrupulous about these. In what concerns your circulation, feet are the most distant body part from your heart, that’s why they get cold so easily. Entering the ice surface with leaky boots can be outright dangerous to your health. It also influences your comfort and may get you out of the ice sooner than you’d want to. Some other things you should remember to consider are the stability of grip on the slippery surface and also whether your boots stay dry in the high snow. These and other characteristics are definitive in the selection of the most suitable ice-fishing boots for an angler – we’ll guide you through them as soon as we’re done with our review of the top 5 greatest winter fishing boots. With the help of the table below, buyers will be able to quickly compare the parameters of the reviewed items. Muck Boots have managed to obtain something of a legendary status. And here’s why: these shoes make their biggest emphasis on durability, ruggedness, and uncompromised warmness. 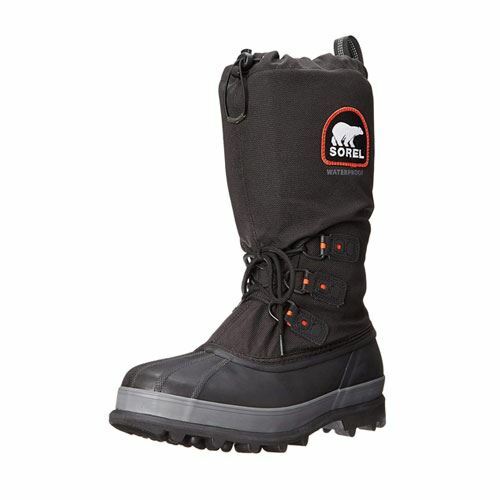 They are designed to suit trekkers who go through snowy terrains in -40º F. The Arctic Sport model keeps water off your boots’ insides thanks to the neoprene top (the same material scuba suits are made of). Both durability and warmth in mind are guaranteed with 5 mm neoprene. 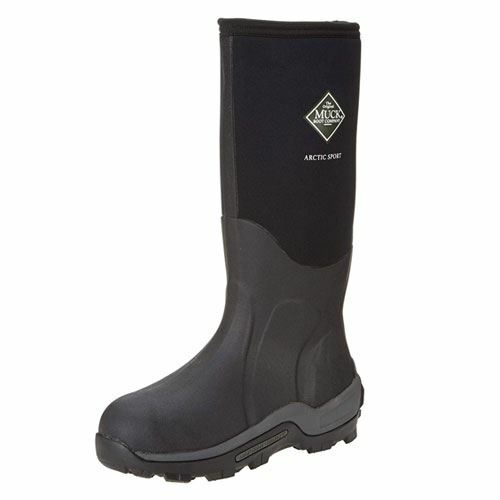 The quality material is also the answer to how these Muck boots counteract the issue of numb feet and bad circulation. Walking is made less tiresome due to the flexible rubber sole, while hard molded lugs on the outsole provide you with improved traction on uneven and slippery grounds. The foldable neoprene of these boots makes for easy getting in and out of the shoes without getting your pants pushed up. When the right size is selected, they can accommodate two pairs of thick socks or a couple of flat insoles to complete your single pair of normal socks. You can choose the correct size by leaving at least a thumb’s width between the tip of your toes and the boot’s tip while having your socks on. We feel that -40º F is a bit of an exaggeration. To increase the cold resistance, make sure you choose an appropriately bigger size and wear them with socks. Bad sizing may result in the boots fitting too tightly, restricting foot movement that is so necessary for keeping your feet warm. high sides prevent snow from getting in. not so warm as advertised. With its black and camo color schemes, these boots by Baffin look very professional. Its lightweight combination of materials makes for a comfortable wearing experience: the shoes are easy to put on/off, while they remain on your leg with no slipping. You can pull tight the nylon snow collar to be able to walk in deep snow without it falling inside the boots. Its pull cord allows you to snug the collar around your pants or jeans when you tuck them in. To ensure warmness of these boots, Baffin uses Thermaplush insulation, enabling the product with an eight-layer inner system. The specially designed tread on the sole maximizes the contact with the ice – in this way, your weight is distributed correctly, which lowers the risk of slipping. All this makes these insulated shoes excellent for snowmobiling, ice fishing, hunting, or simply remaining out in the cold for extended periods. The padding and insulation are truly impressive here, with the materials being on the quality side of things. Both the durable fabric and nice stitching will get you a lot of wear time. You can tell the longevity of those materials from their lasting flexibility. Along with the solidly crafted heavy-duty soles, this allows your Baffin winter boots to resist cracking through years of active service. These shoes are simply huge. Obviously, their puffiness is the direct result of the manufacturer’s effort to accommodate all the padding inside the boot. The drawback of this is that buyers are often confused about sizing. The boots’ size runs small for many people, so take extra care of that matter when buying them. fit tightly yet allow freedom of movement. tricky to get the right size. Sorel is known for its handcraft approach and waterproof technologies. These Bear Extreme shoes boast a vulcanized rubber shell with a polyurethane coating for increased protection against elements. The product’s felt inners hold your feet snugly with minimum slipping and dry quickly. Its rugged outsole provides you with sure footing, while the drawstring-enabled barrel-lock closure excludes the annoying snow inside your boots. With their flexible soles, your feet will have the necessary freedom of movement, not ending up with cold and numb toes. 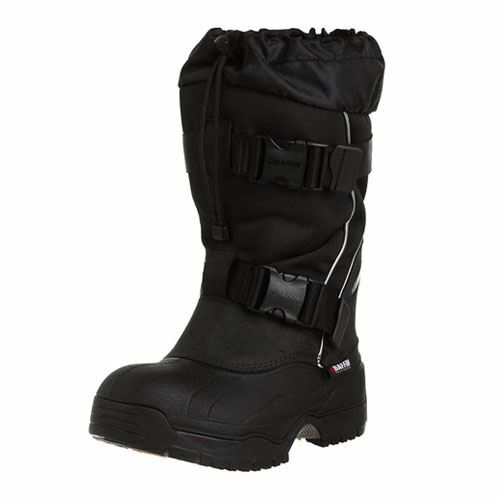 These boots will be a good choice for snowmobiling in colder regions. These Sorel shoes have a great potential for getting your feet warmer with activity. This means that you’ll warm up as you go, even if you are somewhat cold in the beginning. At the same time, they retain heat effectively as well so your feeling of warmness is likely to dissipate if only slowly over hours in the cold. To ensure the optimal performance in a sharp frost, it is recommendable to wear this model with moderately thick socks and remain active. Despite the promise, a slight heel slip has still been noticed. Even though the boot design uses tapering to make your foot fit better from the heel to the calf, you might have to deal with a minute play by wearing an extra pair of socks. Best of all is to get the right size to avoid calluses. high-quality rubber and polymer materials. some models may leak, check upon purchase. 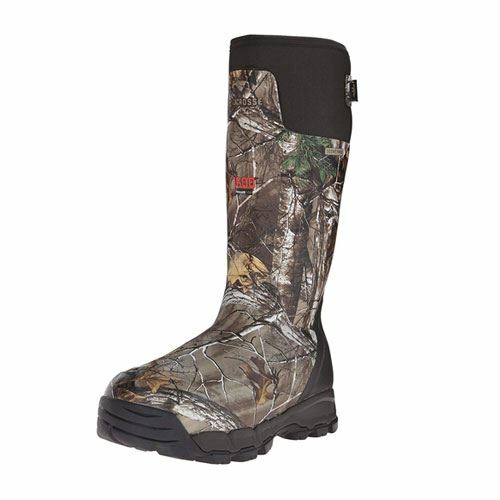 Here, LaCrosse offers us a stylish Realtree-colored article of footwear, combined of premium-quality materials. The sturdy rubber is laid by hand over a 3.5 mm thick neoprene core for optimal flexibility. The synthetic material is breathable and ensures comfortable wearing without scents. Sculptured liner allows for a better air circulation, channels out any moisture collected inside and dries up almost as quickly as natural wool. The boot surrounds your ankle and calf with soft foam for a comfy fit, while you can further tighten the boot’s back with a strap. The rest of the strap you can tuck in with a special clip. To provide the maximum snow protection, your pant legs go inside the shaft for you to strap them down. 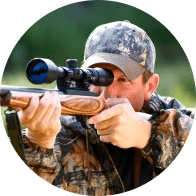 With all their warmness features and well-made, non-slip tread, these best hunting boots for cold weather are very much to the point on a snowy terrain or a steep mountainside. With these, you get a superb insulation. In freezing temperatures, it is suggested that you wear them with a pair of heavy socks to keep your feet super-warm and cold protected. Uninsulated shoes usually let in the chill in just a couple minutes of standing in slush/icy water; however, this is not the case with these lacrosse winter boots, as they seem well-fortified and meant exactly for these conditions. And not just standing – they are rugged enough to take them on a toilsome walk with no fear to get your toes frostbitten. The absence of a heel kick is quite annoying. While the entire design of these boots is focused on a tight ankle fit, there simply is no device for their easier removal. It’s a good thing you will likely never walk out of the boot; however, getting them off without someone else’s help will be hard due to their narrow closure, strong bridge and snugly foot cavity. The heel kick on the back would really come in handy. the upper part is not insulated. Kamik boots stand for affordable quality, hands down. Their construction seems solid and promising in terms of longevity. They are easy to put on/take off thanks to the wide base; it also makes them comfortable to wear with socks. To save your time with these further, Kamik provided the product with a velcro strap right over the instep of the shoe, thus allowing you to control the fit even without extra socks. Don’t forget to loosen the strap before slipping them on. The sole’s flexibility and aggressive traction will do you a good service for gripping in the snow. Anglers can use the drawstring at the top to keep high snow out. A moneywise choice for ice fishing, snowmobiling, sledding with your kids, or simply staying out in the frost. These are great for wearing them on quickly and keeping them dry afterwards. You can put them on in a matter of minutes, walk fearlessly through the deep snow, and then pull them off – all without the hassle of lacing/unlacing while remaining in heavy cold weather gear. After the walk, the boots are pleasantly easy to maintain with their removable liner insert. Unfortunately, they have a quite limited use. Due to their being not very flexible around the ankle, you might feel a bit clumsy working in them. They are also a bit on the heavy side -therefore, less suitable for hiking, or snowshoeing. 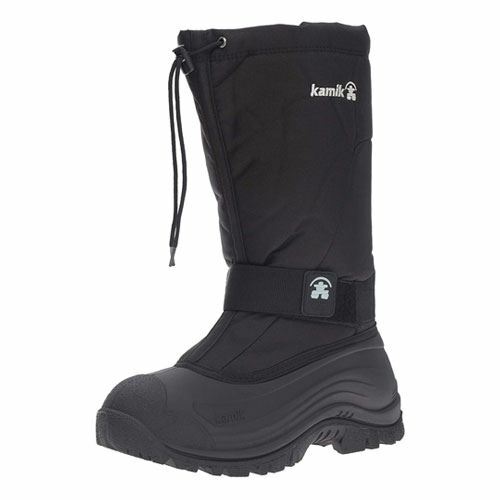 These Kamik boots are not the best for wading in the semi-liquid snow because they are waterproof only up to the ankle. shock-absorbent design of the insole or footpad to keep you comfortable during long hikes. As a rule, warmer boots tend to be pretty bulky. While keeping your feet toasty at -30 °F, they may be not as all-purpose as a lighter pair; for instance, large boots could limit your ability to drive. Living in negative temps can go to a point where you’ll need to own an extra pair of shoes just to drive a car. However, if yours is not an extremely cold environment, you might want to consider buying a less bulky option to be able to drive without changing. Boot materials are key as long as they determine the comfort, wearability, and longevity of your footwear. Nylon is excellent for lightness and higher breathability, but it doesn’t stop water from getting in, not all on its own. At the same time, leather can be waterproof to the max, but its breathability is moot. That is why the best winter boots feature either a blend of materials, such as split-grain leather combined with nylon, or advanced materials, like Gore-Tex in Danner boots, to be both breathable and waterproof. Rubber is, undoubtedly, the most reliable material for soles and the one offering the greatest traction. However, due to heaviness as its main disadvantage, many manufacturers seek after alternative sole materials, such as polymers or modified/synthetic rubber. A good example of this is Kamik’s rubber (He) created specifically with lightness in mind (50% less heavy than natural rubber). Depending on whether an angler puts the emphasis on sturdiness and durability or a higher speed of movement, he/she should choose the combination of materials accordingly. Wetness in your shoes begins with snow, bits of ice and drops of cold water entering through the material and/or from over the top. This explains why rubber and hybrid rubber (He) are superior to leather in the winter boot manufacture – rubber remains both leak-resistant and impenetrable for cold air, where leather would soak slowly through unlacquered patches in below-zero temps. This goes for the boots’ sole and instep, while the waterproofness of the shaft mainly comes with polymer materials, also allowing your foot to breathe and not accumulate wetness in the form of perspiration. Some anglers, however, may have a somewhat lower level of requirements to water resistance. If you are planning to be standing and walking on unstable and slippery ice, rather than trailing through ankle-deep slush, your focus, then, should be on a waterproof and gripping outsole. Check your purchase by putting it to test in water/slush reaching over the foot portion of the shoe. Completely sealed boots are great for sleety weathers, whereas a good grip is more important in dry frost. The thickness of insulation is what makes your shoes bulky; still, buying larger boots is worth it where the temperatures get real low. The trick is, you can wear good quality socks even with well-insulated fishing boots, thus maximizing the heat retaining capabilities of your footwear. In not-so-freezing weather, though, an over-insulated pair of boots could be too hot to wear. Normally, you can judge the amount of insulation by grams, where 400 g will make for a cooler pair and 2,000 g is quite hot. Moderate options, such as 800 g and 1,000 g are the most popular due to their higher versatility. You also should understand that insulation isn’t the only thing that renders the boots warm. A concept of ‘action warmness’ is your another guarantee of a comfortable wear as it may completely balance out the thinner insulation yet preserve the lightness of your shoes. In some winter footwear, you will notice a plastic honeycomb separator immediately underneath the liner, which creates a heat-insulating layer of air at the bottom of your boot. For people doing a lot of walking, this technology may be more preferable to thicker and heavier boots. Experienced anglers know that mobility outweighs warmness when things get active. You wouldn’t want to be clumsy if you need to walk around regularly in deep snow/slush or have a lot of heavy pulling/lifting on the agenda. In the footwear industry, lightness is born with hybrid materials, like fabric/rubber in MuckBoots or a polymer construction of the Baffin. Modern polymers and modified rubber bring in a good lot in terms of cold protection and grip. As the result, composite boot designs are both lightweight and durable, with thermosetting parameters completing the bargain. However, you might as well opt for classic 100% waterproof rubber if you don’t mind working out with heavier shoes. In what concerns the height and ankle fit, the general practice tells us that you can’t go wrong with the higher boot. Taller boots protect your heel and ankles more effectively. It greatly reduces the risk of strain on rocky terrains and also provides you with improved warmness. Some winter styles go up and over your calf to enhance the comfort. However, beware of too-high boots if you’re walking around a lot because they might tire you more. Earlier we mentioned breathability, as an important parameter to protect your feet from getting sweaty due to all the activity. Although many brands may not mention this directly in their product descriptions, a moisture-absorbing inner liner is a great thing to check for. Another useful extra feature is the compatibility with heating inserts. This type of boot heaters uses charge to keep your feet toasty for up to 8 hours. In addition, the inserts could also improve the overall waterproofness. Many winter boots are enabled with cleats to get you firm footing on slippery surfaces. Whether you need them built-in or prefer slipping them on/off when needed really depends on your lifestyle. Certain anglers prefer removable cleats to avoid tracking in their car while driving. On the other hand, integrated cleats provide you with a surefire anti-slip feature since they are impossible to walk out and save you the trouble of trying to wear them on in bulky winter clothes. A heel kick is necessary for some boots that tend to sit on your leg maybe too well. Always make sure that your newly bought boots are equally easy to put on and off. Laces or straps in the uppers will come in handy for taking the shoes off; still, they often are missing in winter footwear that’s why you should look for a heel kick whenever possible. Don’t put your fishing boots on before you make it to the lake. Give your feet some freedom and wear the boots only when on the ice. For long-distance hikes, you’ll benefit remarkably from setting out in a lighter pair and later switching it when you start feeling colder. Have a change of dry socks too, especially if you are prone to sweating. A combination of wool socks under a pair of thin wicking socks is very efficient. Always leave a channel for the trapped moisture to escape. For this, try not to lace/strap your boots too tightly at the top. Provided your shoes have a wicking, breathable insulation, your legs will be able to dry up as you walk. We hope that you get it right. Not only high-quality polymers and leather ensure you durability and waterproofness, but also the design of your boots itself. A well-thought-out boot construction will include a multilayer insulation, a removable liner and, at the same time, will remain lightweight to not get your feet sweaty during long hikes. Extra goodies in the premium models will be an EVA cushioned midsole, special snow traction, and a rubberized or rugged exterior. Take your time considering the suitable model and stay reliably warm on your outings!